Portable libraries of African literature and curriculum books in Book Boxes are distributed to local schools originally in Kenya and now mainly in Tanzania. Since 2007 our expanded objective is to also contribute to the well-being of African children and their caregivers. This is due to the devastating effects of the HIV/AIDS pandemic. All members of the board are volunteers. Our only "non-project" expenses are bookkeeping and banking. All other monies are spent on-the-ground on our African projects. In 1990 Anne Pearson had an opportunity to live and teach in Kenya. A desperate need for books was discovered. Collaborative projects were developed with Kenyan and Canadian teachers. With donations from Canadians an initial 28 schools were supplied with book boxes containing at least 75 African storybooks. 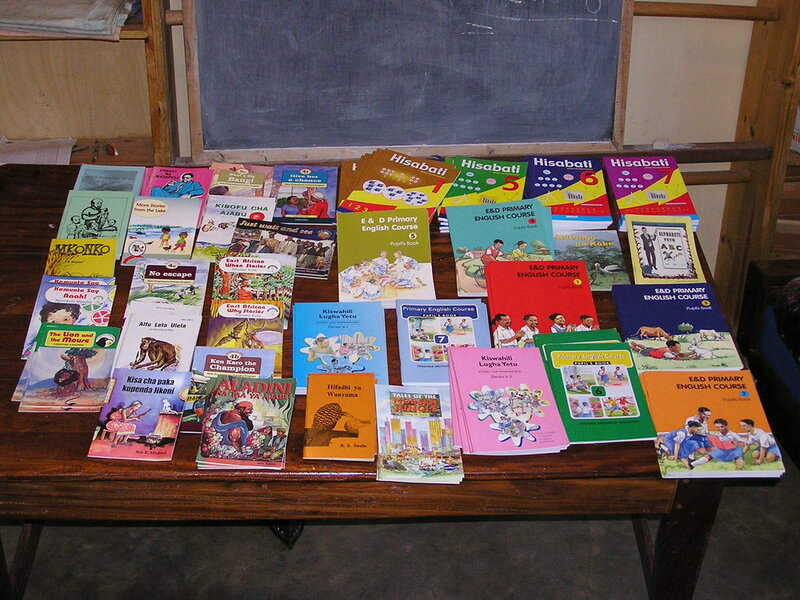 African books were purchased from publishers in Kenya and Tanzania, placed in strong metal boxes built by local craftsmen and distributed one or two book boxes per school. With the devastating impact of HIV/AIDS, the Society's mandate expanded in 2007 to provide a diversity of educational and health needs primarily in Mufindi District in south west Tanzania. Our expanded projects included building 4 libraries, assisting in the development of a children's village for up to 80 orphans and vulnerable children and providing ongoing operating costs, building 5 classrooms for rural schools, providing a nutritional meal in a mug for all students at Igoda village school, training for a grass roots medical program through home based care, providing diagnosis and treatment for HIV/AIDS, building Igoda's large community hall, funding educational seminars related to health and job opportunities, implementing income generating projects including basket and mat weaving, sewing, market gardening, raising chickens. Education remains a top priority as we continue to purchase and deliver culturally relevant storybooks and curriculum books, expand the mobile library project, sponsor scholarship students, train in Kenya 2 Tanzanians in computer technology, develop a computer lab at Luhunga Seconedary, fund a Tanzanian artist to teach art at village schools and complete 2 classrooms at Mwefu Primary. Children's Village (Orphanage) receives funding for food, household supplies, school supplies and fees, medical supplies, transportation and market garden supplies. With the additional increase in funding from other societies, we have been decreasing our support for the operating costs of the Children's Village. However, it continues to be our main expenditure. Health and Community Outreach activities funding for a Home Based Care Program serving 16 villages, completing the construction of the Children's Village clinic, supporting a lab technician and cleaner at the Mdabulo's HIV Care and Treatment Centre and sponsoring educational and health related topics at Igoda's Community Hall. Vocational Training activities include the continued operation of the sewing school and providing computers and training for Luhunga Secondary. Luhunga's Girls' Dormitory for 64 village girls will be completed by January 2017. After 25 years the essence of the African Children's Book Box Society continues to be advancing literacy in East Africa by providing portable libraries in the form of book boxes. Our future collaborations will support initiatives focused in this direction. We are excited about a future collaborative project involving writing African stories for African children. Continuing to build libraries for rural schools remains a focus for our Society.